Saudi Arabia is ranked as one of the most dangerous countries in the world to be a woman. Despite this fact, Saudi-born, British fashion stylist Basma Khalifa has been persuaded to travel back to Saudi Arabia - a country she hasn't been to since her parents moved to Northern Ireland when she was three years old. Although she grew up Northern Ireland, she's never felt totally at home in the UK. Maybe she can start a new chapter of her life in Saudi Arabia which has become more open under the new crown prince. But just a few days after arriving in the country, the news breaks of the murder of the Saudi Arabian journalist Jamal Khashoggi, and her experiment takes on a darker turn.\n\nBasma travels to Jeddah - Saudi Arabia's more 'liberal' city - and moves in with her three aunts. She immerses herself in Saudi Arabian life, but the strict laws and social codes aren't easy for her to stomach. Basma struggles with how to behave in public and what to wear and with every slip-up, she comes head to head with the Saudi Arabian government minder who has been assigned to monitor her movements. Just when she is starting to think she can't take it anymore, she discovers Jeddah's underground party scene and she feels more at ease. A spiritual journey to Mecca seals her newfound faith in Saudi Arabia, and she's hungry to see what else it has to offer her. Since June 2018, women in Saudi Arabia have been allowed to drive and Basma wants to try it for herself. 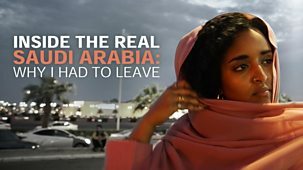 Despite her aunt's warnings that it could jeopardise her whole visit, Basma decides to go ahead and rent a car, and everything goes well until Basma mentions the name of a female right-to-drive campaigner who the Saudi Arabian government has put in prison. \n\nWith a unique and unprecedented insight into real Saudi Arabian life through her family, Basma is ready to finally see whether she could permanently return to her native country.